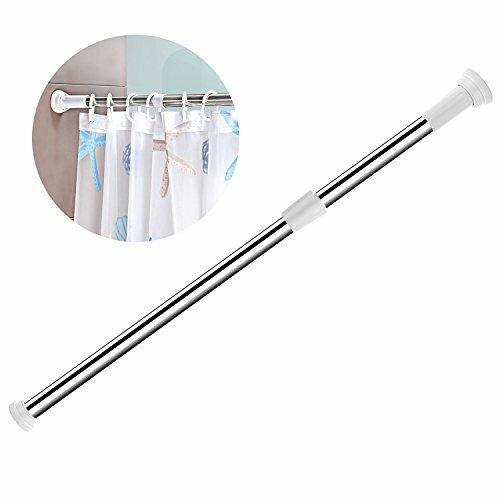 ◕‿-KOP's Shower Rods Solve All Kinds of Problems in Little Space curtain rod, shower rod,tension rod,coat hanger, shoe racks and cleaning agent, save a lot of your space.Also it has more uses waiting for you to discover. ◕‿-EASY INSTALLATION: Only need to adjust the appropriate length, then stretch the rod, until it is placed in a suitable position. Easy to use, no screws required, rubber tip to protect walls and never no holes in your wall. ◕‿-By testing, the friction of the wall and the extension of the rod will affect the effect of use. In general, the greater friction of the wall and the shorter extension of the rod, the better effect of use. ◕‿-Warranty：VDS Tension Curtain Rod can enjoy the two-years warranty with Customer Service & Technical Support if it is quality problem. ◕‿◕Spring Tension Rod:New Constant Tension patented technology,Thicken Stainless Steel, Strong and Durable,can be freely adjusted the length. ◕‿◕After-sale Warranty:We offer a FULL MONEY BACK GUARANTEE,If for any reason you aren't satisfied with your purchase within 3 years, just let us know and we'll refund money for you. If you have any questions about this product by KOP, contact us by completing and submitting the form below. If you are looking for a specif part number, please include it with your message.